Unusual and worked with great attention to detail. 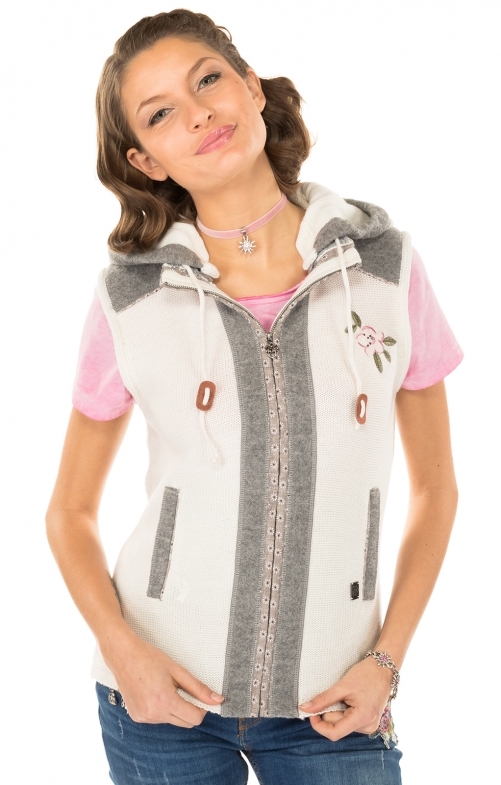 The sporty traditional knit vest with hood from the Spieth and Wensky collection. Young styling through the material mix knit, Walk with contrasting cotton fabric in a small floral design. The two side pockets are practical because there is always something to accommodate. Small heart pendant on the zip through which the vest can be easily opened and closed. The wide adjustable hood is casual and as a hoodie vest extremely young. The floral motif on the front is embroidered and provided with small rhinestones. The same motif can be found in the back as a flat delicate print again. Optimal colour match. A very nice vest that is so in this way really only in our traditional fashion retailer.